*Note to Instructors*: This assignment is suitable for teaching large anthropology classes. 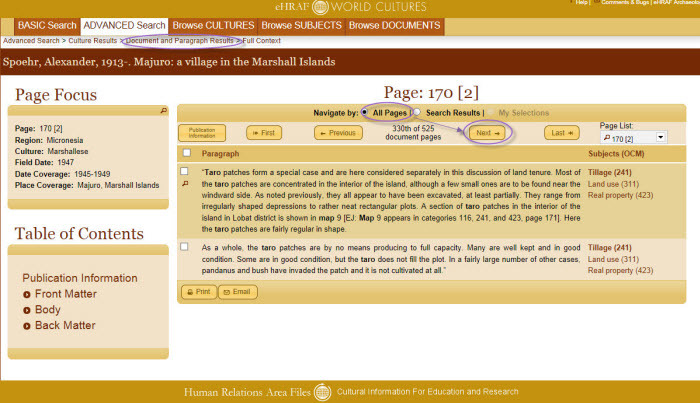 The questions draw from specific text document results of Advanced Searches in eHRAF World Cultures. An Answer Key for this assignment is available here. The Answer Key is password protected. Instructors can email hraf@yale.edu to request the password. In the Marshall Islands plots of land are shared by kin group members. For this assignment, you will be using a specific textual description available in the eHRAF World Cultures database about taro plots and how they are distributed to kin group members. You will also use a map and chart provided in this text to analyze these data and answer the questions below. Be sure to follow all the provided directions as they are given to assist you. 1. Log on to eHRAF World Cultures through your institution’s online library or at the HRAF homepage (https://hraf.yale.edu) by clicking on the brown “eHRAF World Cultures” button in the Access the eHRAF Databases section in the right-hand margin. 2. 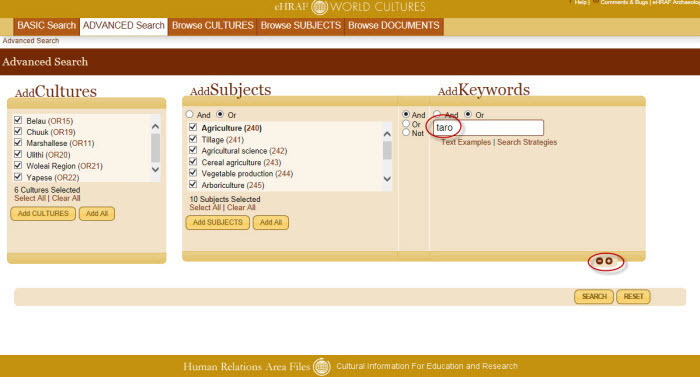 Once logged on to the eHRAF World Cultures database, click on the Advanced Search tab on top. 3. Click Add Cultures. Select Oceania, then find Micronesia, and select the culture(s) by checking the boxes. 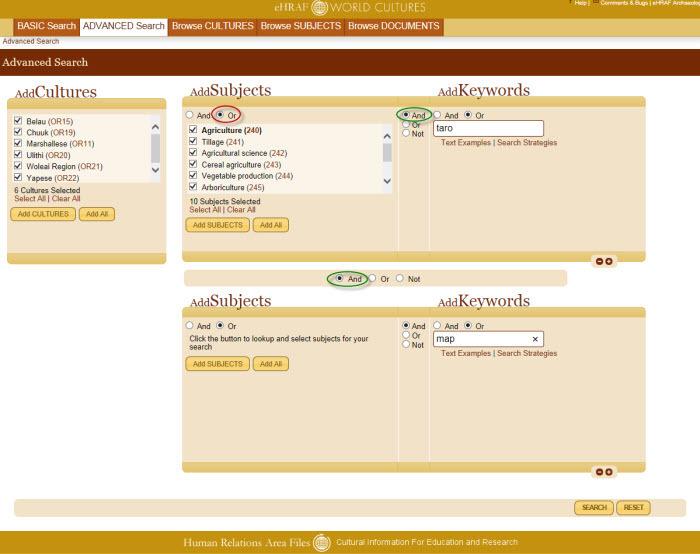 Click “Add Cultures” to have the culture names appear on the list in Advanced Search (see Figure 1). 4. Click “Add Subjects”, then click on the arrow for “Economy, Food, and Resource Exploitation”. 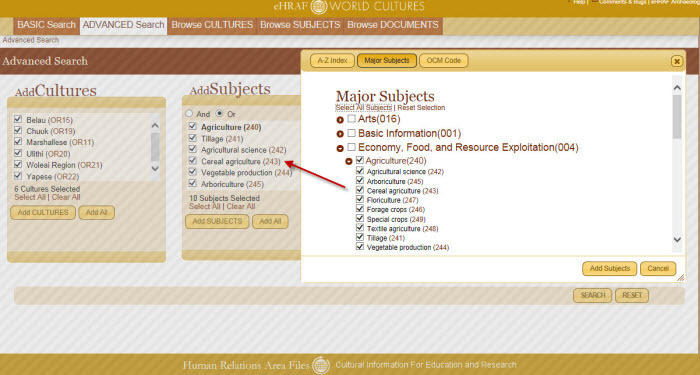 Select the subjects for “Agriculture” by checking the box(es). Click “Add Subjects” to add them to your list (see Fig. 2). 5. Type the word “taro” into the keyword box to the right and click + in the lower right hand corner (see red circles in Fig. 3). This will add another clause. Type in the word “map” in the keyword box. When completed, your search should look like Fig. 4, below. Make sure that the Boolean operators (the round radio buttons) “OR” and “AND” are set correctly between subjects, keywords, and clauses. If you select the button labeled “OR” then at least one, but not all, of the subjects under the agriculture heading are included. “OR” (red circle) will increase your search results. Between the 1st and 2nd clause, use “AND” (green circle) as this will “narrow” your search to paragraph results that will have any of the cultures, any of the subjects, but must contain the words “taro” and “map.” Now you have created a powerful search! 6. Click the “Search” button to launch your search. After clicking “Search”, you should see a page with region and culture results. This particular search should have found 9 paragraphs in 3 documents in 2 cultures. Click on “Oceania” then on the “Marshallese” culture name (see red circle in Fig. 5) to view the paragraph results. Fig 5. Initial search results in “culture results” view. 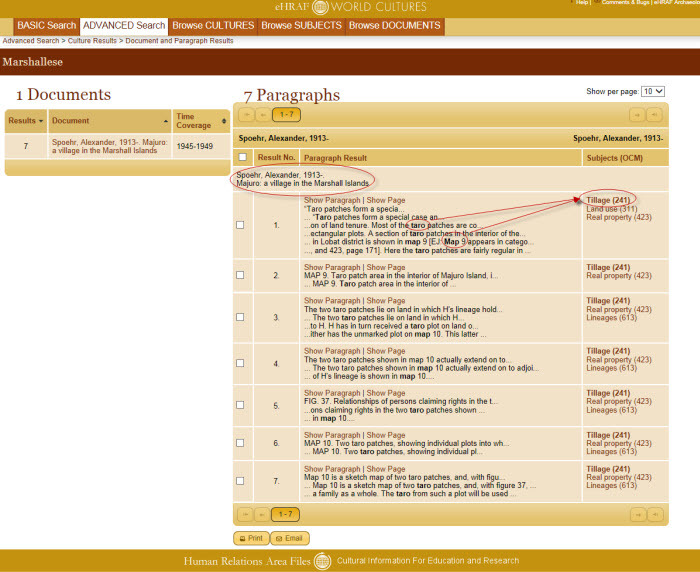 Red circle shows where to click to obtain more detailed paragraph-level results. You should see a document with 7 paragraph results for the author and title information on Spoehr, Alexander, 1949. Majuro: a village in the Marshall Islands (see Fig 6). Verify that you are working with the correct document before you proceed. Specifically, you will be working primarily with text, map, and kinship diagram located on pages 170-176. Click on the “Show Page” option. This will bring you to page 170 of the text describing the taro patches. Notice that your Region, Culture, Field Date, Date Coverage, and Place Coverage are listed to the left your text record (see Fig. 7). Fig 7. Paragraph-in page results and page navigation controls. To navigate through the pages, use the NEXT button, the drop down box with the page numbers, or the table of contents to the left. Navigating the document text takes a little practice, but you can always click the “Document and Paragraph Results” link on top of the screen to return to your starting point. Now answer the following questions using the kinship diagram from page 173, the map from page 175, and the text from pages 170-176. There is enough information in this section to apply your knowledge of the class materials and figure out the answers to questions below that are not specifically stated by Spoehr (1949). 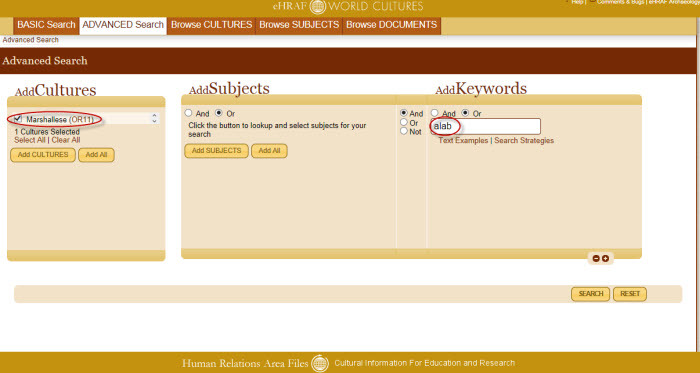 Questions marked with an asterisk * will require you to perform an additional search in the eHRAF World Cultures database. You might want to perform that search in a separate tab or window so that you do not lose your original search. What are the eight regions in which you can begin a search? _________, _________, _________, _________, _________, _________, _________, and _________.